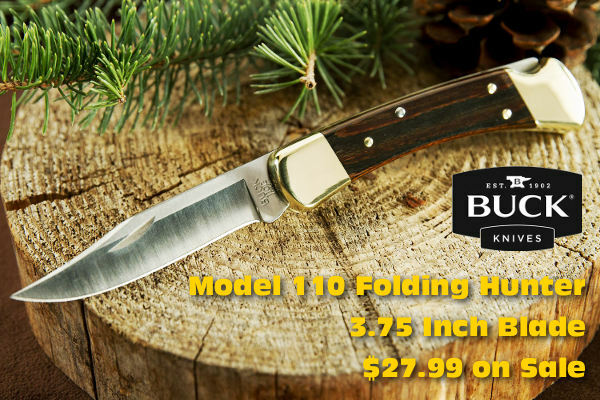 Here’s a new product we’re pleased to see on the market. Walker’s, a major supplier of hearing protection for shooters, has introduced a new set of smaller-sized NRR 23 ear muffs specifically designed for infants and small children from six months to eight years of age. Walker’s new Baby & Kids Muffs provide protection for infants and children against dangerous loud noises. The muffs are designed to fit smaller heads properly, and protect the sensitive hearing of youngsters. The adjustable headband on these muffs is designed for the smaller heads of kids up to age 8. These Baby & Kids Muffs have a 23 NRR noise reduction rating. We wish that were at least 25 NRR, but this can be supplemented with foam plugs for extra protection (plugs under the muffs). The important thing is that these muffs are sized right for youngsters and fit properly (for a good sound-seal). Walker’s® Baby and Kids muffs start at $14.99 MSRP and come in four color choices: blue, pink, green and camo. 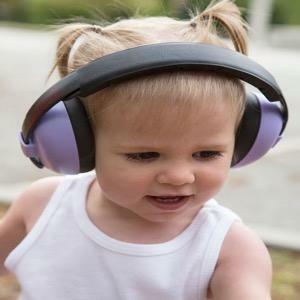 Share the post "NEW Hearing Protection for Infants and Small Children"
Story based on report in Midsouth Shooters Blog. The Barrett rifle is a true Tennessee success story: A rifle born from sketches hand-drawn at a dining room table by then 26-year-old photographer Ronnie Barrett, who was born, raised, and educated in Tennessee. The firearm design — considered impossible at the time — was a shoulder-firable, semi-automatic .50 caliber rifle. Using sketches of his design, Barrett worked in a one-bay garage with a tool-and-die maker to build the first prototype. His creation, the Model 82/M107, pioneered an entirely new classification of rifle and changed battlefield tactics. The .50-caliber rifle is fielded by the military forces of about 70 allied governments. Today, Ronnie Barrett is one of only four people in the past 100 years to invent a rifle type classified and adopted for use by the United States military. The M107 was recognized, in a ceremony in Washington, D.C., by the Office of the Chief of Staff of the United States Army as one of the “top ten greatest inventions” for its service. Share the post "Barrett M82/M107 Named Tennessee’s Official State Rifle"
You may not know it, but a team of youngsters from California is the winningest junior team in the history of the National Matches at Camp Perry. Despite California’s tough gun laws, the young shooters on the California Grizzlies Rifle Team have managed to rack up impressive victories in competition, achieving excellence season after season. Right now the California Grizzlies are seeking donations to support their effort to attend the 2016 National Matches at Camp Perry. You can make a secure PayPal donation through the Grizzlies’ website, www.TeamGrizzlies.org. The California Grizzlies squad has always excelled — it remains the only junior team to ever win the Infantry Trophy (NTIT) at the NRA National Championships. In 2009, Team Grizzlies O’Connell shot a 1284 to win the NTIT, becoming the first junior team to ever win the event and the first civilian team to win in 79 years. In 2013, the Grizzlies again shot superbly, winning not only the High Junior Title, but the Civilian Title as well. In fact, in 2013, the young Grizzlies squad beat ALL the adult teams except the powerhouse U.S. Army Marksmanship Unit Team. Here is the 2009 Grizzlies Squad that won the NTIT outright, beating ALL other teams. This video was filmed in 2010 during a week-long training clinic held at the Coalinga range in central California. During the clinic, Grizzlies members honed their position shooting skills. We wish these boys and girls good luck in their quest for another team victory at Camp Perry. Share the post "Help Support the California Grizzlies Rifle Team"
Starting this summer, the NRA National Smallbore Rifle Championships will no longer feature a separate “High Women” award. From now on, men and women will compete shoulder to shoulder in the same category — every shooter will be scored in a single group regardless of gender. (There will still be age-based categories; also men and women have always been eligible to win match top honors regardless of gender). Men and women will now compete on equal terms at the National Smallbore Championship, competing for the same honors in “gender-neutral” classifications. This change was officially adopted this past January at the NRA Board of Directors winter meetings. 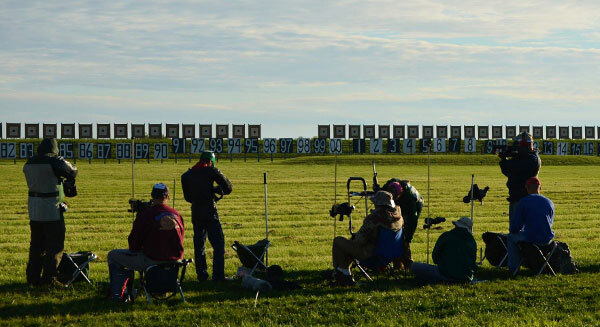 It only affects the NRA National Smallbore Rifle Championships for now, but a positive reception could see “gender-neutrality” spread to regional matches and below, and maybe even other NRA disciplines. The women’s category was first introduced to the smallbore championships nearly 70 years ago. Back then, military shooters were dominating the field so convincingly that several new categories were created to recognize the accomplishments of civilian shooters. This move saw the creation of not just the Woman category, but also Junior and Senior. The latter two have since expanded even further (e.g. Grand Senior, Intermediate Junior) to accommodate the skill discrepancies within levels and they make perfect sense to have; junior shooters are generally more inexperienced and many seniors are affected by physical limitations. But the same can no longer be said of the women’s category. While military shooters still do very well nowadays, the proliferation of female service members has seen quite a few woman match winners. There are also a number of extraordinary female civilian shooters who finish near the top of each year’s overall standings. For instance, women shooters placed first in each of the two aggregate matches that determined last year’s Conventional 3-Position Champion. Share the post "NRA Smallbore Championships Go “Gender Neutral”"
Here’s a great Do-It-Yourself (DIY) project from Martin Tardif. 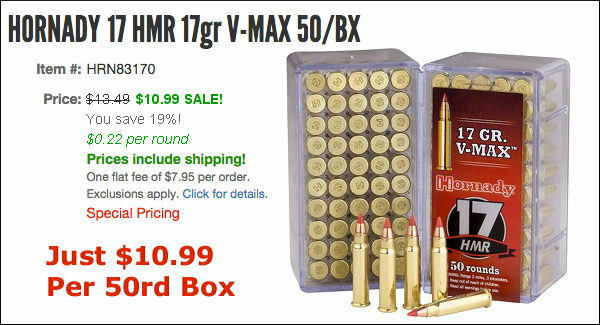 Build your own height-adjustable ammo caddy for under ten bucks. This is a great project for F-Open competitors as well as anyone who shoots with a pedestal front rest, either on the ground or from a bench. The ammo caddy attaches, via a flexible arm, to your front rest. 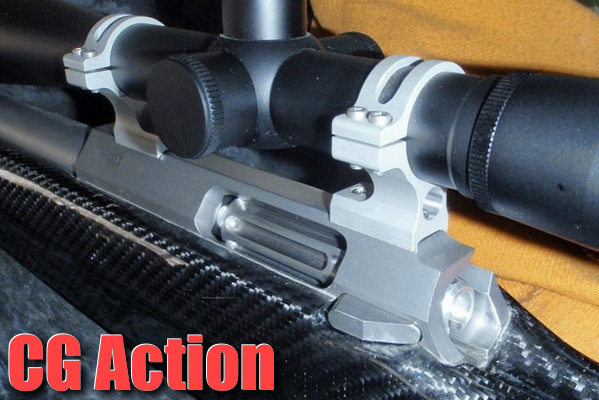 The flexy arm allows you to position your ammunition close to your rifle’s feeding port. 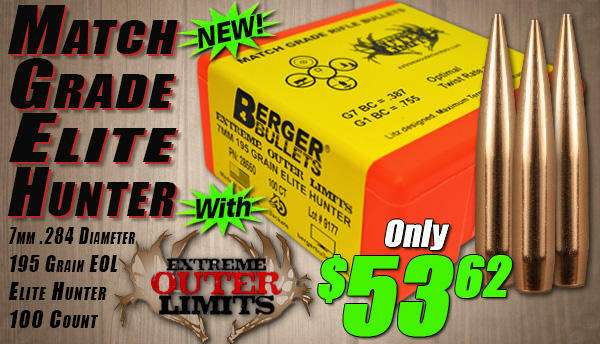 That makes it easy to grab cartridges and load them into the chamber without shifting your shooting position. Nice job Martin! The total cost of the whole project, according to Martin, was just $8.00! Share the post "Caddy-Hack: Build Your Own Ammo-Holder for under $10.00"
First Handgun on the Planet Mars? Photo courtesy of NASA’s Jet Propulsion Laboratory. This amusing story comes from the Midsouth Shooters Blog. One of the latest photos beamed back to NASA’s Jet Propulsion Laboratory (JPL) from a Mars rover appears to show the first handgun ever spotted on Mars. Some commenters say it looks like a Glock 17 pistol. Others argue that the big slide and overall size make it a spitting image of a Desert Eagle. What’s your take? Here at AccurateShooter.com we think the object in the Mars rover photo resembles the big, slab-sided Heckler & Koch Mark 23 in .45 ACP. What do you think, see any resemblance? 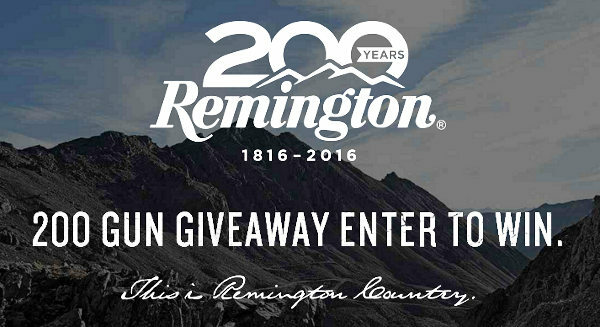 Share the post "First Handgun on the Planet Mars?" Most long-range benchrest stocks are three inches wide because that used to be the max width under the rules for Light Gun Class. Many folks may not realize that the IBS, the NBRSA, and the Williamsport organizations have all modified their Light Gun rules to allow wider forearm widths in registered 600-yard and 1000-yard competition. A wider stock provides increased stability and resists rotation (torquing) as the gun is fired. If you’re building a new Light Gun, you may want to consider a 4″-wide or 5″-wide forearm. Do check the rules of your local club or regional organization to ensure the wider width is allowed in the matches you attend. And if you plan to shoot F-Class as well, stick to 3″. Under F-Class (Open) rules, “the width of the rifle’s forend shall not exceed 76mm (approximately 3 inches)”. This color pattern is what Bill calls “Prairie Dog Camo”, a Rutland laminate in orange and dark gray, with olive ‘accent’ layers. 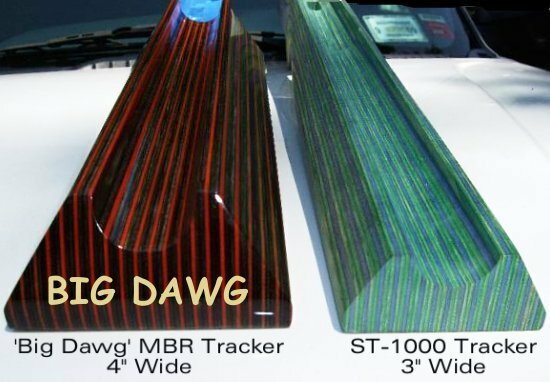 The price for a ‘Big Dawg’ in Rutland laminate is $625. In African Obeche wood (any color choice), the price is $855.00. For more info, contact Bill Shehane at (704) 824-7511, or visit his website, www.ScopeUsOut.com. Ultra-wide stocks are also legal in many rimfire benchrest disciplines. 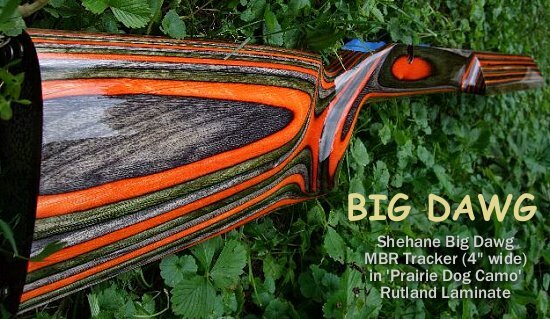 Shown below is a rimfire rifle built with a 4″-wide Shehane Big Dawg stock. This gun is used in ARA Unlimited competition. Extra-wide stocks like this can also be used in the IR 50/50 Unlimited Class and RBA Unlimited Class. Why use a wide stock for rimfire where recoil is not an issue? The extra width definitely provides more stability in the bags. This is noticeable when cycling the action during the loading process — the gun shows less “wiggle” when opening and closing the bolt. The larger mass of wood also, potentially, provides additional vibration damping. A wider stock design carries more weight (per inch of length) and more mass is distributed outboard. Initial testing shows that the wide stocks work well for rimfire shooters who like to grip their gun — the gun feels “planted” with less wobble when the stock is gripped or cheeked by the shooter. 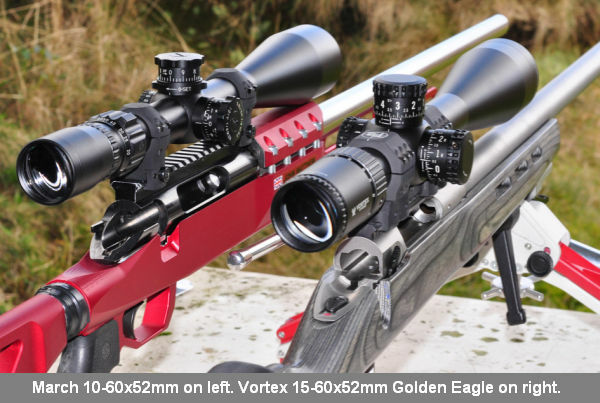 Share the post "Go BIG: Wider Stocks for Mid-Range and Long-Range Benchrest"
Our British friend Vince Bottomley has field-tested the brand new Vortex 15-60x52mm “Golden Eagle” riflescope. We first viewed this scope at SHOT Show and were impressed. Now Vince, in a Target Shooter Magazine review, has confirmed that that the scope works great in the real world. It has good glass, excellent tracking, and the image stays sharp even at full magnification. Vince says this 15-60X Vortex will give other high-magnification scopes a run for their money. In fact the Vortex Golden Eagle may be the new Performance-for-Price leader in the category. Price in the USA will be $1500.00. 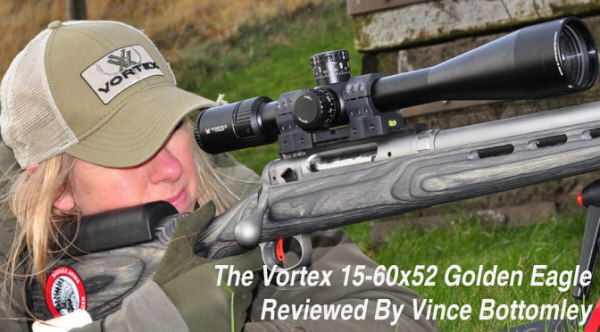 Vince writes: “The Vortex deserves to line up alongside the competition – namely the March 10-60, the Nightforce 15-55 and the Leupold 7-42. The price is remarkable at [$1500.00 in the USA, under £1500 in the UK]. 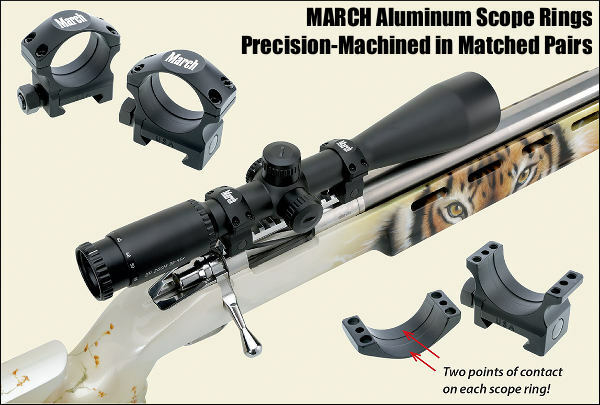 If you are contemplating the purchase of a scope in this magnification range, the Vortex must be on your shopping list.” This new Vortex features ED glass, and weighs 29 ounces, just one ounce more than the 15-55X Nightforce Comp. 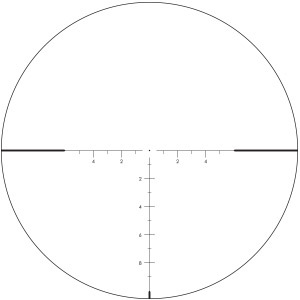 Two reticles are available — a Fine Cross-Hair (FCH), and the Vortex ECR-1 reticle with MOA-based windage and elevation hold lines. Turrets have 1/8 MOA clicks. Share the post "Vortex 15-60x52mm Golden Eagle Shines in First Field Test"
The Bureau of Alcohol, Tobacco, Firearms and Explosives (ATF) has issued updated regulations regarding firearms lost or stolen in transit. The new standards require FFLs to report in-transit theft or loss of firearms within 48 hours of discovery. Each licensee shall report the theft or loss by telephoning ATF at 1–888-930–9275, and by preparing and submitting ATF Form 3310.11. The disposition entry should indicate whether the incident is a theft or loss, the ATF-Issued Incident Number, and the Incident Number provided by the local law enforcement agency. If any of the firearms are later located, they should be re-entered into the A&D Record as an acquisition entry. A comprehensive, 12-page discussion of the new rule, which went into effect on February, 11, 2016, is set forth in the Federal Register. The BATF has provided compliance instructions on its website. The NSSF anticipates these instructions will be updated in the near future to reflect the new regulations. In the meantime, we suggest that FFLs read the Rule Change Notice in the Federal Register. SUMMARY: The Department of Justice is amending the regulations of the Bureau of Alcohol, Tobacco, Firearms, and Explosives (ATF) concerning the statutory reporting requirement for firearms that have been stolen or lost. 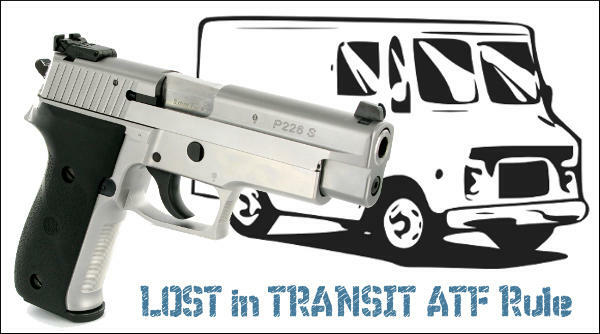 The final rule specifies that when a Federal Firearms Licensee (FFL) discovers a firearm it shipped was stolen or lost in transit, the transferor/sender FFL must report the theft or loss to ATF and to the appropriate local authorities within 48 hours of discovery. The rule also reduces an FFL’s reporting burden when a theft or loss involves a firearm registered under the National Firearms Act (NFA) and ensures consistent reporting to ATF’s NFA Branch. In addition, the rule specifies that transferor/sender FFLs must reflect the theft or loss of a firearm as a disposition entry in their required records not later than 7 days following discovery of the theft or loss; moreover, if an FFL reported the theft or loss of a firearm and later discovers its whereabouts, the FFL must advise ATF that the firearm has been located and must re-enter the firearm into its required records as an acquisition or disposition entry as appropriate. Share the post "ATF Changes Rules on Firearms Lost or Stolen in Transit"
Have a good look at the photos below — this may be one of the most noteworthy target strings we’ve ever published. What you can see is the effect of barrel tuner position on point of impact (POI). You can clearly see that the tuner position alters the up/down POI location in a predictable fashion. This remarkable 15-shot sequence was shot by French benchrester Pascal Fischbach using his 6 PPC fitted with a CG (Carlito Gonzales) action and a Bukys barrel tuner. 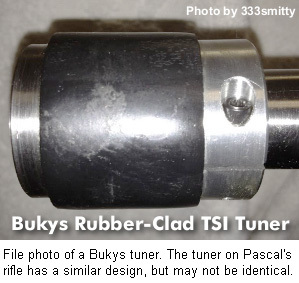 Pascal reports: “After [bullet] seating and load validation, I put the Bukys tuner on, screwing it out 10 turns. According to Carlito, the CG’s super stiff action-to-barrel fit gives a faster vibration modulus that is detrimental below 10 turns [position of the tuner].” Pascal’s procedure was to screw out the tuner 1/4 turn progressively from one shot to the next. He shot one bullet at each tuner position, with a total of 15 shots. CLICK HERE to SEE Large Version of Complete Test Strip (All 15 shots in a row). Pascal observed: “Note the point of impact displacement [from shot to shot] tracks clearly along a sinusoide (sine wave curve).” This is indeed notable and significant! This shows how the tuner’s ability to change barrel harmonics can alter the position of the muzzle as each bullet exits, resulting in a higher or lower POI. Pascal sent his results to Carlito Gonzales in Argentina for analysis. Editor’s Note: While this target sequence clearly shows how tuner position can alter bullet point of impact, this, by itself, does not tell us which tuner position(s) are best for accuracy. That will require further multi-shot group testing, involving careful experimentation with tuner position (and powder charge weights). But for those folks who doubt that a tuner can make a difference on a short, fat barrel, just take another look at the photos. 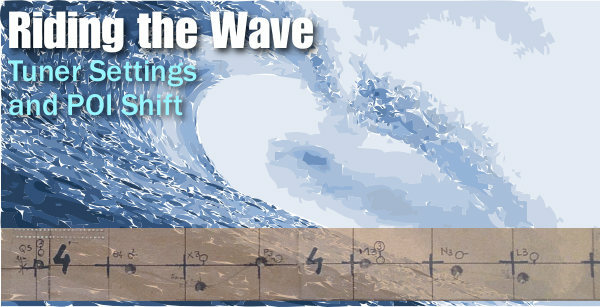 The up/down changes are undeniable, and noteworthy in the wave pattern they follow. Share the post "Riding the Wave — How Tuner Settings Alter Point of Impact"
The Camp Perry “campus” is better than ever, thanks to millions of dollars in site improvements in recent years. Key grounds and buildings improvements have been made at the historic Camp Perry base, which boasts America’s largest rifle range. Over the past five years, the base has poured more than $10 million into facility enhancements. These projects are funded with a mix of Federal and state monies, as Federal facilities are operated on state (Ohio) lands. In 2015, Camp Perry took on more than 20 projects, totaling over $900,000. The renovations included chipping and sealing of the range roads to keep dust off of the ranges. That’s a big deal that will benefit all visitors to Camp Perry. In addition, new HVAC systems were installed throughout the complex. That will be welcome in the hot summer months. Also in 2015, the lighting on Scorpion Road by the clubhouse was upgraded. For 2016, there will be additional improvements to the Camp Perry site. Approximately 20 more projects are slated for the current year, with a similar budget (around $1 million). Two North Barracks Buildings renovations are almost complete. Those Barrack facilities were closed during the 2015 National Matches, but will be up and running for the 2016 National Matches — allowing even more housing options right on the Camp Perry base. Camp Perry range photos courtesy Shawn McKenna. 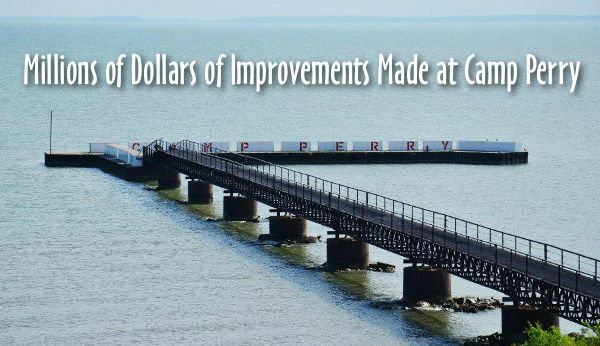 Share the post "Camp Perry Invests Millions in Facility Upgrades"